Cousin Harley is the rocking hillbilly persona of Paul Pigat, an extraordinary guitarist vocalist and songwriter. 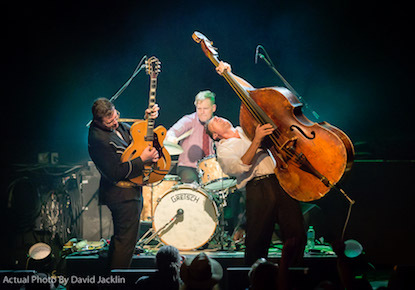 Hailing from Vancouver, BC, Cousin Harley has a hard-earned reputation for delivering everything from classic honky tonk and cow punk rippers, to a helping of western swing and classic jump blues. He plays in the old tradition – slugging it out hot and heavy in roadhouses across the land. Cousin Harley’s latest album, Blue Smoke: The Music of Merle Travis, is a tribute compilation Pigat made to honour Merle Travis 100 years after his birth. 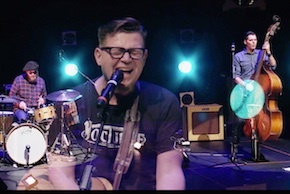 Their fifth release, The Dutch Sessions, recorded direct–to–tape in the village of Schipluiden in The Netherlands, over the course of three rainy days off on their 2013 European tour. 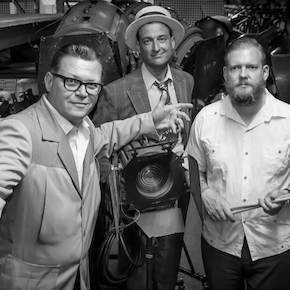 Paul Pigat, Keith Picot, and Jesse Cahill take us on a rollicking romp through the repertoire from their live show, paying homage to many of the great artists who have inspired them over the years. It’s stripped down, primitive and bristling with the energy and attitude for which this trio is famous. Gritty baritones, twanging guitars, slapping bass and kicking drums abound! It doesn't take very long to hear why his intuitive rhythms and fluid, creative solos have become an indispensible part of so many musicians′ and bandleaders′ sounds. Whether he’s playing a searing solo to elevate the soaring vocals of a traditional gospel rave up from The Sojourners or flying in to support Jakob Dylan at a showcase in New York, Paul Pigat’s singular dedication and peerless work ethic have earned him a growing respect within music's inner circles. An extremely versatile artist, Paul heads four diverse Vancouver bands and is in high demand as a sideman, having recorded and toured with the likes of Neko Case, Ndidi Onkuwulu, Jim Byrnes, Michael Kaeshammer, and Carolyn Mark, and has shared the stage with Taj Mahal, Mae Moore, Lee Aaron, the Blind Boys of Alabama, Joshua Redman, Big Sandy and His Flyrite Boys, Aaron Neville and more. From solos raw enough to melt the door off an old Cadillac to delicate etudes written for the crows to fly home to, Paul Pigat is a guitarist who can truly play it all. Is he a genteel sideman, unrepentant redneck, sensitive singer/songwriter, classical composer or a Mulligatawny blend of all the above? Listen long enough and you’ll realize it really doesn’t matter what he plays. Music this good transcends boundaries and resists any attempts at categorization. And, even if you reached the point where you thought you’d figured Paul Pigat out, by that time he’d have gone and changed on you again. So, perhaps it would be better if we all stopped thinking, buckled up, and held on to enjoy Mr. Pigat’s wild ride for all its worth.